It’s time again this week for Fan Feedback! Last week on Twitter, we asked you about your preferences for camera systems in games. As simple a topic as this sounds, it’s actually a very important part of game development. The camera and how it’s implemented is a major part of what a game looks like and the lasting impact it has on you. For instance; Star Wars: Jedi Outcast technically has an option to play with it’s fantastic lightsaber mechanics in the first person, but is that how anyone remembers the game? Of course, Jedi Outcast is a more complete game because of that extra camera option. Typically, given the interactive nature of video games, we like to have the option to play in whatever way we want, and this is reflected by the results of last week’s poll! 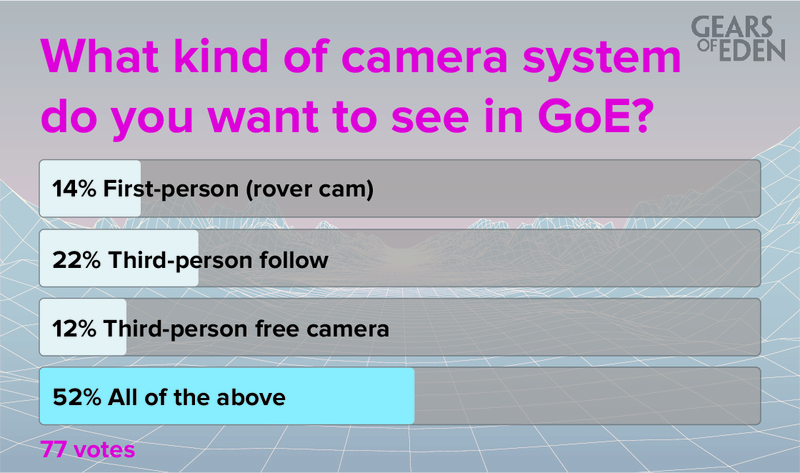 While a good number of you voted for your favorite method of controlling a camera, just over half of you thought it’d be best to have all three camera systems implemented! And you know what? We agree. For the most part, we’ve been on the same page as these results; we have a camera that will follow obediently if you don’t tell it what to do, but will also allow you to control it freely should you want. This is major for players like myself who get frustrated the moment a game takes camera controls out of their hands. I want to take cool pictures! Speaking of the virtual camerapeople who love that “perfect shot,” we’ve also made it as simple as a button press to remove the UI from your screen. I’m not pointing fingers, but some of us recently played a game that required the navigation of multiple menus to ditch the UI. That said, we have been a little hesitant about the use of a First Person camera. We’ve been coming around as of late, but it was this poll that really pushed us over the edge! That first person camera and it’s proper implementation are now on our list of desired features, so thank you! As a writer, I’m especially excited for the storytelling opportunities this will allow us. That’s it for this week’s Fan Feedback, but stay tuned later this week for another Dev Update! If you want the latest news on all things Gears of Eden, be sure to follow us on Twitter and Facebook! Also, if you feel so inclined, please take part in this week’s poll, in which we ask you about your preference on Sci-Fi aesthetic. Personally, I’m leaning more towards the stylized/adventure look (I mean, I’ve referenced Star Wars twice in this post), but I’d love to hear what you think!